Standing at the foot of Greenwood’s historic Keesler Bridge, Mary Carol Miller recalled the citizen uproar that saved the aging icon from demolition. “It was in terrible shape. The walkways had holes in them, and the whole thing was just a mess. The supervisors wanted to take it down,” said Miller, the author of several books on historic homes and landmarks in Mississippi. Completed in 1925 to replace an older bridge, the 290-foot truss bridge pivoted on a central pier to allow the passage of boats on the Yazoo River. Steamboat traffic on the river was already dwindling, yet the new bridge became the pride of the town. The newspaper announced upcoming bridge turning dates to warn motorists of long delays as eight men, straining with effort, operated the turning gear mechanism with a giant key. Folks lined the river banks to watch the span swing open. The bridge turned for the last time in the 1950s, when it stuck in the open position. By the late 1990s, it was deteriorating badly, prompting the county supervisors’ call for demolition—to the horror of residents who viewed the bridge as a link to their town’s history. One day, Miller’s mother called her “in a state” about the issue and suggested they collect friends to stage a sit-in at the bridge. When the initial outrage turned to action in 1999, a group of volunteers and officials succeeded in obtaining grants totalling nearly $1.4 million for the repair and renovation of the bridge. It was rededicated in 2003. Once again a source of local pride, the gleaming Keesler Bridge is listed on the National Register of Historic Places and designated a Mississippi Landmark. “This bridge has a tremendous amount of emotional meaning for this town,” Miller said. She and other Greenwood residents are still smarting from the recent demolition of an early-1900s grocery warehouse with the potential, as they saw it, to become a venue for conventions. Miller said the brick building was significant for its “extraordinary structural details.” Robert Johnson is said to have played the blues on the streets there in the 1930s. “Nobody will ever build a building like that again in downtown Greenwood, or downtown anywhere else,” she said. Ditto for Mount Holly, a neglected antebellum mansion on the verge of crumbling into dust in Washington County. “Oh, don’t get me started on that,” Miller said with a roll of her eyes. Growing up in Greenwood, Miller wanted to be anything but a writer like her mother, Sara Criss, who worked as the Commercial Appeal’s Greenwood bureau chief for 30 years. Watching her mother rush every day to get stories and photographs ready for the 5 p.m. bus to Memphis, young Mary Carol decided she wanted no part of deadline pressures. Criss had started out covering social events and football games but wound up reporting news from a front row seat in the civil rights movement. She wrote eye-witness accounts of the racial unrest and violence her hometown experienced, like many others in the South, during voter rights marches and desegregation efforts. Miller eventually chose a career in medicine. She was a practicing family doctor before becoming a full-time mom to her two children. Her husband, Jimmy, practices neurosugery in Greenwood. The Millers are members of Delta Electric Power Association. She submitted magazine articles on historical topics but “got a ton” of rejection letters, she said. Her first published article focused on the Star of the West, a captured steamship sunk by Confederates in the Tallahatchie River to block a Union flotilla. Then came her big break. After publishing an extensive magazine article on lost mansions in the state, the University Press of Mississippi asked Miller to expand the theme into a book. She spent three years researching sites, seeking photographs, scouring archives and interviewing families. 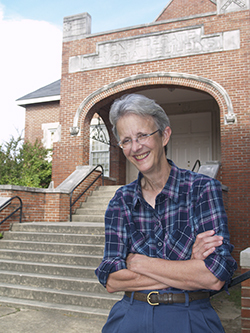 Miller likened her research for the books to chasing the ghosts of long-gone hotels, resorts, schools, homes, churches, synagogues, public buildings and industrial sites. That all changed when she teamed with Greenwood photographer Mary Rose Carter. Together Miller and Carter produced five books on historic homes and landmarks still standing throughout the state. Miller’s passion for Mississippi history, architecture and preservation pervades each book. She and Carter worked together more than 15 years, traveling the state to track down subjects and document their beauty and history. “We just had a blast. We were like Thelma and Louise—or Lucille and Ethel on some days,” Miller said. Miller’s literary focus eventually returned home to Greenwood and the surrounding area. She and Carter published a book of infrared photographs made in Greenwood, and Miller collaborated on a book of historical Greenwood postcards, published by Arcadia Press. 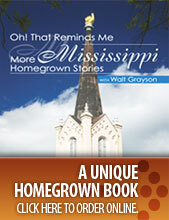 Miller’s 10th book title, “Greenwood: Mississippi Memories,” grew out of conversations with Greenwood residents Allan Hammons, a local designer and collector of historic Greenwood photographs, and Donny Whitehead, a collector of old advertising trinkets, letters, postcards and other ephemera. “We kicked [the book] idea around for years,” Miller said. “Then, back in January, we had a meeting of the minds and said, none of us is getting any younger. And if anything happens to any of us, this is never going to happen. “Actually, we’re kind of doing it for my mother,” Miller said. Criss had urged her daughter to get with Allan and Donny and “do something” to preserve and share their historic collections. Miller’s most challenging project, however, may await her in the stored crates of her mother’s writings, including a memoir. “I just can’t figure out what to do with it. It’s committed to Ole Miss’ journalism archives at some point,” Miller said. Criss tapped out her memoir on a manual typewriter in 1991 for the benefit of her grandchildren. Her story details life in Greenwood as she knew it, starting in 1921. Miller suspects her mother’s papers may inspire a book project or two, but for now she shares them with the world via the Internet. She spent a year posting the contents of the memoir, including Criss’ experiences during the civil rights era, to a blog Miller titled Daughter of the Delta. Reading her mother’s writings gave Miller new insight into local history, as well as her mother’s—and her contemporaries’—thoughts as the struggle for civil rights unfolded in their hometown. “She was walking a tightrope.... Their whole world was changing and they didn’t agree with the violence that was going on, but they weren’t ready for the change either,” Miller said. Delving into her mother’s writings was a rewarding experience for Miller. “It was very cathartic and helped me know her better,” she said. She regrets, however, that her family did not read the memoir until after Criss’ death in 2009. Any questions the family has will likely remain unanswered. Books by Mary Carol Miller are available in bookstores.“Greenwood: Mississippi Memories” is sold only at Turnrow Books, in Greenwood. Sara Criss’ memoir, with notes from Miller, can be viewed at daughterofthedelta.com.